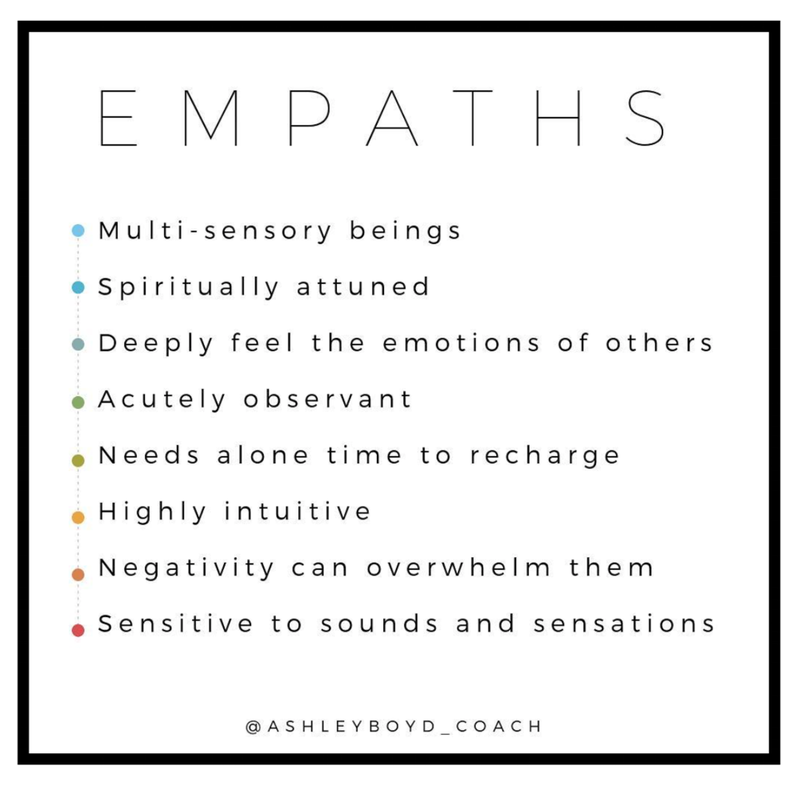 There are many types of Empaths, but generally speaking, an empath is a person who has the intuitive ability to read/feel the energy around them, understand and deeply feel other people’s feelings and emotions (positive or negative) as their own. In other words, Empaths, unlike the majority of people out there, feel then think their way through life. These people are usually highly sensitive in certain ways and very intuitive, whether they’re aware of it or not. They are often easily overwhelmed by large crowds of people or excess external stimuli - loud sounds, touch, strong smells, etc. Most Empaths need time alone to recharge or reboot themselves before they have to venture out again to engage with the outside world. Some Empaths are highly introverted, where other Empaths can be extroverted, or a combination of the two. I am an empath. I have known this for quite some time now but my parents didn’t understand my behavior as a young child. As an adult, I’ve sat at my Mum’s kitchen island many of times and heard her tell the unique and sometimes odd sounding stories about my highly sensative nature as a child. I was the kind of child who was very sensitive to most of what life brought into my little world. I was sensitive to bright light, loud sound, touch and often large crowds of people. Planning to take me to the zoo or anywhere like it as a child was a difficult task. Often times, my parents couldn’t share with me their plans to take me to the zoo or a birthday party because I’d become overwhelmed and sometimes hysterical with the anticipation of the idea of going, and nine times out of ten, we ended up not going. This type of behavior happened often, especially when it came to high stimulus events and activities regarding a large crowd of people. At the time, my parents had no idea why I responded this way to what seemed like normal childhood experiences. As a young adult, I began to realize that I could sense and feel when someone was down, unhappy, low, depressed, sad, unsure, defeated, scared or in pain, etc. I could also sense when someone was elated, happy, excited and positive. I felt as though I could literally feel the sensations of that person’s emotive state in my body. This experience would typically last until I was no longer in proximity with that person(s). I also began to realize that certain music or songs would move me to a point where I was brought to full on tears, even if I was happy or had no reason to be upset. In high school and in college things began to deepen for me. Even though I didn’t know how to really understand what was truly going on during these encounters with other people, I somehow intuitively knew and accepted that feeling other people’s emotional states was just a part of who I was. I thought I might have picked this up from my mother as she was always very intuitively “plugged in”, but I later realized my mother’s gifts were different than mine. I slowly began to understand that the more time I’d spend with people who were in ‘lower-vibrational state’s at the time (sadness, unhappiness, unworthiness, bitterness, anger, inferiority, etc. ), the more I began to energetically take-on/adopt them as my own. This became increasingly challenging for me to manage. This also translated into some of my earlier relationships in my early to mid-twenties. I started to attract more people with heavy or low-vibrational frequencies and relational needs and a large part of that was because I didn’t know how to protect myself from allowing energy leeches into my life. It wasn’t until I was 27 years old that I started to uncover and process my intuitive gifts and learned this incredible and powerful information that changed my life for the better. Thanks to a dear woman named Joanne who helped me to learn and practice the foundational principles in energy work and offered group opportunities that helped me to hone my intuitive abilities in a safe and educational way. If you think about it, we receive a lot of schooling in our traditional approach to education in this country but in all the years we studied in this system, we were never taught how to tune-in and assess our own energy or other people’s energy. We certainly didn’t learn about how these lower energy states can negatively impact us (especially empaths) and most importantly, how to protect and manage our own energy so that we don’t want to crawl into a hole and not come out. I recognize that our education system is flawed in so so many ways, which is a post for another time, but in my humble opinion - this is the kind of education that helps to set the foundation for conscious, healthy and grounded children. Did you know that 20% of our population are genetically predisposed to be more aware and empathetic? [Dr. Elaine Aron, Ph.D]. There is 20% of our population who like me, have struggled/or are struggling currently with understanding this intuitive and innate gift and how to manage it. That leaves 80% of the population who are not predisposed to this gift, the majority of which do not understand the people who have it. Some of these people might express and/or judge empaths as being “too emotional”, “too sensitive,” “too high strung,” “too introverted,” “too independent", “too picky about the environments they choose to be in,” and the list goes on. I’ve personally experienced some of these labels. For example, I’ve had relationships (friendships and romantic relationships) with people in the past who had a hard time understanding or accepting this innate part of me. As you can imagine, it created a difficult dynamic for peace and full authenticity when one person couldn’t/wouldn’t understand the other. Judging another person creates a divide between people and finding peace and harmony becomes more illusive and difficult for us to hold onto. On a grander scale, judging anyone at any level creates a fracture in our collective consciousness (the set of shared beliefs, ideas, attitudes and knowledge that are common within a universal social group). This perpetuates the idea among us that we’re more different as people than we are alike, which is incredibly false. Right now, the world is feeding off of this false idea I mentioned above and generating a tornado of negative energy. This is manifesting all around the globe in different forms and in different destructive ways. The more we choose to not understand another person or have love for another regardless of our differences, the more destructive this tornado of energy grows and becomes in our mass field of consciousness. The more we stay stuck in our limited thought patterns and belief systems, the more the divide between all of us will continue to deepen. We’re all connected at an energetic level. When you strip away the body in everyone, what you’ll find is a pure soul that is separate from our personalities and the choices we make during the human experience. The soul is our inner-light that is divine and will surpass time and space. The body is simply the vehicle we chose to come to Earth in, whereas the soul is who we really are. We all chose to come to earth to work out our karma through the human experience and hopefully learn lessons along the way so we can evolve into better people. We are far more alike than we are different. The world needs healing and Empath’s are here to use their gifts to shed light in their own unique and individual way. Just as much as Empaths should learn more about their empathic gifts and how to manage them effectively for themselves and the world around them, we also need the other 80% of the population to be aware of Empaths and recognize that they do exist in our society. More over, it’s important for all of us to be open to learning about the Empaths we may work with, or are in a relationship with, etc. for the purpose of creating more peace, understanding and love within human exchanges. So, whether you are married to an Empath or you have an Empath as a child, or whether you work with one, or are friends with one - this information can help you understand that person so much more, which of course will elevate your interactions with them in the now and in the years to come. You are not crazy or weird. You just have a very unique gift you may want to explore. The next step for you is to learn more about how your empathic gifts show up for you individually, as everyone is different. You then NEED to learn how to protect your energy and the energy of others. This is vital to having a good relationship with this gift and not allowing it to take over your life and relationships. I’ll be sharing a resource on my site soon that will educate you on how to do this. Share your amazing gifts with the world in the ways that feel right for you. The below timeline captures “The Empathic Spectrum” which is a useful excerpt from an article in Psychology today. You’ll see a term coined “HSP”, which stands for “highly sensitive people”. These people are sensitive to energies and can be intuitive but unlike Empaths, they do not take on the energy of other people as their own. That’s the big difference between HSP’s and Empaths. Note that Empaths can be more inclined to attract a Narcissist into their life because of their very attuned, loving, nurturing and caring nature. In the distorted mind of a narccisit, Empaths are the ideal partner - someone they can unload their years of emotional baggage, wounds and unhealed traumas/drama’s on. It’s taken me most of my life to come to the awareness that I came into the world as an Empath. It’s taken time for me to understand how I can deflect and protect myself around negative or heavy energies and remain grounded and balanced in a multitude of settings. At this point in my life, I’m able to go to a concert and not be consumed by other people’s energies or talk with/coach strangers and not take-on their emotional state. I am now able to use my gifts in healthy and useful ways that honor me and the ones I’m engaging with - and all on my terms. My hope is that you now know more about what being an Empath truly means and that you’ll find more patience and compassion in being one, or being closely connected to one. If you have questions about being an empath, please do not hesitate to reach out to me via the Contact page on my website.